Little Spurs Pediatric Urgent Care, Southwest is a pediatric urgent care center serving the children, adolescents and young adults in San Antonio with extended hours, making them a great option 7 days a week when your child's primary care office may not be open. You can find this clinic located at 1714 SW Military Dr, Suite 108 and patients can walk in to see them today from 9:00am to 9:00pm (last verified on 2018-08-10). Recognized favorably amongst their patients, Little Spurs Pediatric Urgent Care, Southwest has an average rating of 4.8 stars out of 5 based on 445 total ratings. 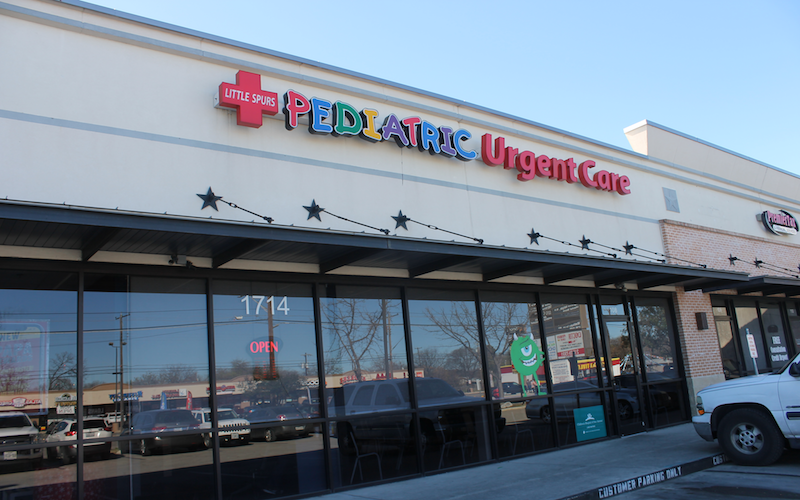 Nationally, most pediatric urgent care patients see average wait times between 15-30 minutes before being seen by a provider, which should be expected at Little Spurs Pediatric Urgent Care, Southwest as well. I have been multiple times, it’s very convenient, I can sign in online but even if I don’t it does not take long. I have not had any problems, everyone is courteous and they see you in a timely manner. I would highly recommend to take your child there. Our experience was great. We were help with the up most care. Dr Kim is the best! Great clinic and great staff! I was great! And really fast thank you all!! Everyone in the office does an AMAZING job! Everyone, was very nice and everything was very clean, except i was hoping the doctor had prescribed my grand daughter some medication. Instead she referred me to over the counter medicines. We don't have the funds to purchase the meds. Thats why my granddaughter has medicaid. I know the doctor means well, but if she had prescribed something i could have gotten it for my granddaughterwith her medicaid. I feel like i waisted my time taking her and getting her a prescription for her discomforts. All they did were her vitals, i could do that at home. Doctors here are very caring knowledgeable...the nurses are a wonderful bonus.. They take time to see your child and make sure parents leave with answers on why or what is the cause of our child's illness..Thank you for the compassion & caring you give to my little1..
NP Kim V. was rude and in a hurry! Had no bedside manners whatsoever! Fist time it goes this bad. No character, no friendliness she'd be sent home if it was up to me.. The best clinic ever! Awesome staff! Very good place thank y’all! Friendly and courteous front staff and nurse. Caring and informative doctor. Moderate-long wait as expected with as much patients they had.